For a case study in the inadequacy of words to capture experiences, consider the gulf between describing the Nakatani Gong Orchestra and hearing, seeing, and feeling it live. 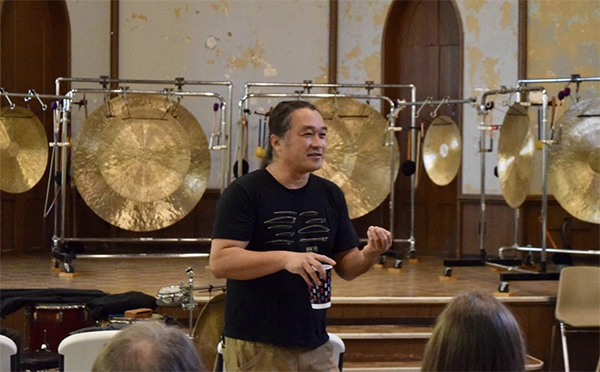 A “large-ensemble nomadic sound art project,” according to founder, director, instrument-builder, and performer Tatsuya Nakatani, the NGO enlists local volunteers to play seventeen variously sized gongs. 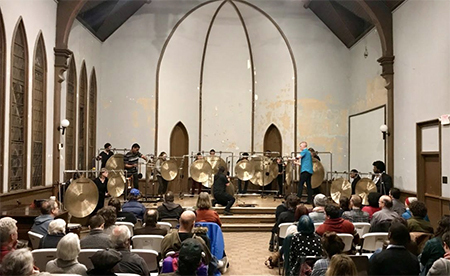 A description of the event might dwell on the bows and beaters that fourteen Ohioans recently used to play the gongs in concert. It might catalog the exact sounds the group created from one moment to the next. However, the proper language for this experience is that of enchantment. Historic St. John’s Episcopal Church, rightly in-demand as a chamber music venue, proved the perfect space for the NGO on Saturday, March 30. Listeners could choose between a second-floor gallery, where the sound blended into a powerful whole, or floor seats, where the group’s raw energy remained clear. Fortunate too was the amount of space available, for the Cleveland Uncommon Sound Project, the event’s presenter, attracted a capacity crowd. A disarming introduction from Nakatani betrayed nothing of the power that would radiate from his gongs, drums, cymbals, and singing bowls in his solo improvisation that constituted the first half of the concert. “Improvised” here hardly means “unstructured.” The piece ended just as it began, with the meticulous bowing of a large gong framing a whirlwind of a central section. Fundamental to Nakatani’s style is his ability to shift between white noise and clear tone with little apparent change in physical action. Soaring pitches and overtone-based chords emerged from washes of what listeners might identify as a familiar gong sound. From one bow to two, large gong to small, and gongs to drum kit, Nakatani traced a remarkably seamless path from one sound to another. Precise manipulation and controlled chaos coexisted, sticks and small instruments flying offstage at peaks of activity. At one point, Nakatani struck and stirred singing bowls, which swirled around upside-down cymbals, which in turn rested on a floor tom and piccolo snare as the kick drum thumped below. He even buzzed his lips, brass instrument-style, into the snare to create a ringing tone, before gradually moving back to the restless resonance of the bowed gongs. More immersive than propulsive, the NGO performance that followed presented both the instruments and Nakatani in a contrasting light. He had rehearsed with the fourteen game, attentive performers — who ranged from professional percussionists to non-musicians — just hours before. In concert, he directed with a range of hand gestures and eye-contact cues while also performing himself. His signals shaped everything from playing technique and volume to pitch and timing. Tones emerged, alone and then in octaves. Bass notes bloomed from soft impacts under shimmering high notes. Drones rose to shattering volume then broke like waves crashing ashore, revealing clean pitches that had lain underneath all along. Listeners could feel these sounds in their chairs, as well as hear them reverberating from every surface. Even the weather joined in. The sound of the orchestra faded into the quiet rustle of sleet pelting the ground outside — an easy enough moment to describe, but much like the rest of the evening, impossible to recapture.